Our yard has some landscaping that I'm sure was done when the house was built. There is a nice garden area that has strawberry plants and I think some parsley growing in it. There are also a few scraggly shrubs, a rose bush, a few unwanted mulberry trees, and lots of weeds. (The neighbor said the previous owner didn't do much with the garden. Big surprise.) I went out sometime last month and picked a garbage bag full of weeds. I guess weeds grow faster than anything because now the garden is very overgrown. Mickey spent some time out there this afternoon. 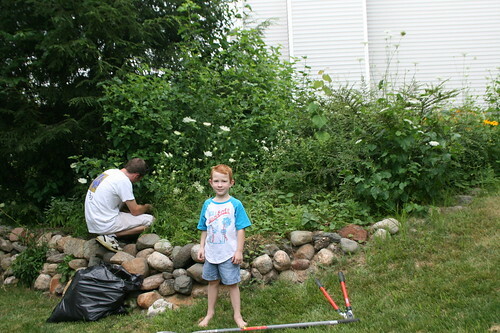 Kade was assisting, handing him the shovel or loppers. Meanwhile I tackled some bushes before Mickey could use electric trimmers on them. (I didn't want them hacked up.) I pruned until my thumb was numb. This morning I took off all the wallpaper in the kids' bathroom. I can't wait to paint! It's going to be a fun bathroom.